Medieval valor requires folks that have tough character. As you probably know, the Medieval era wasn't a time of peace and prosperity. fights could break out at any time. There were wars between students and townspeople about the quality of the drinks at local pubs. In Italy, an army of over three-thousand men was sent to retrieve a wooden bucket that their enemies had stolen from their wall. We get it, the Middle Ages were a time of famine, fleas, and fear. What else were people going to do other than fight? And when it came to living on through songs a poems told by bards from town to town, there was no better way to make a name for yourself than standing your ground. Whether you decide to guard a castle hold or a simple bridge, let people know that you're not going anywhere by wearing this Black Knight costume. No matter what they might do, you'll shake it off as but a flesh wound! 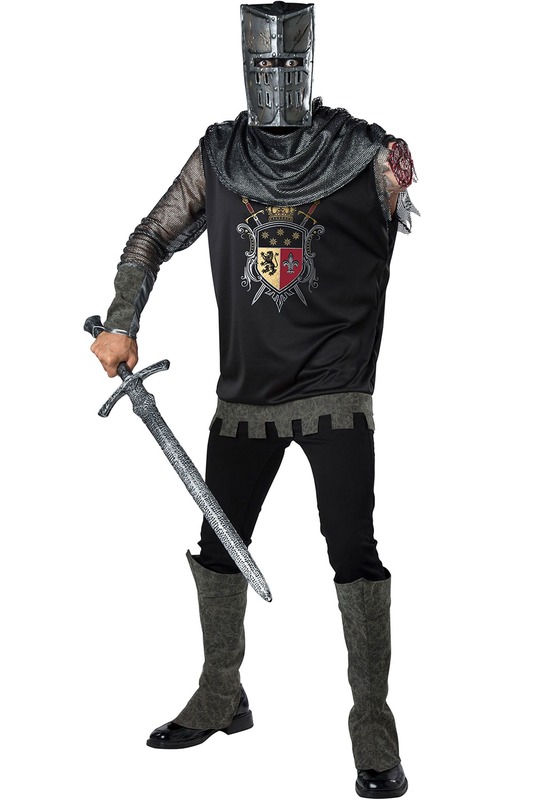 You'll be dignified and just a little grotesque in this layered Black Knight costume. One sleeve has chain mail texture and a faux leather gauntlet while the other... well, there is no other sleeve. 'Tis but a stump with prop blood and gore. The shirt is printed with your shield and layered under a chainmail-like cowl. Topped with a helmet, you'll be instantly recognized as one of the bravest knights from the Middle Ages! Nothing is going to stop this knight from doing his duty! Make this costume more battle ready with costume gloves and a sword that you can keep swinging, regardless of your little injury! Want to make this a group look, battling it out with a classic white knight will make any costumed crowd chuckle. Nothing like a photogenic fight to make Halloween night unforgettable!